THE RIGHT KITCHEN SET MEANS no bendy, too soft silicone that isn't sturdy enough to turn your omelettes, no cheap heads that rip or break off of the handle. And for goodness sake, no mystery odors coming from the kitchen gadget making you fear using them on your family's food! KIT IS DESIGNED WITH sturdy, top-grade silicone heads that are firmly bound to their natural hardwood acacia handles to keep you cooking for years. 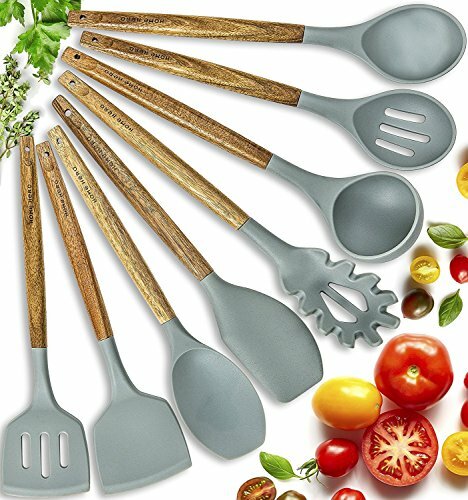 Our non-toxic, BPA free, FDA approved kitchen cooking utensils set always LOOKS, FEELS AND SMELLS JUST YOU EXPECT IT TO. YOUR KITCHEN WILL FEEL GOURMET when you're cooking with this sleek, refined kitchen accessories set. You're way beyond those standard black, plastic first apartment sets! The soft curves of the acacia wood and the chic grey silicone look gorgeous and are made from only the highest antibacterial quality hardwood acacia that can last up to 40 years. The non-toxic silicone heads withstand temperatures ranging from -22°F/- 30°C to 392°F/200°C and the easy-to- grip, comfortable handles and balanced weight make a nimble job of all your kitchen mixing and flipping. ★ PRESERVE YOUR COOKWARE FOR YEARS by protecting it from scratches made by non silicone cooking tools. Your pots, pans and pocketbook will thank you! And how many times have you set your cooking tool down to come back to an ugly deformed spatula turner and a ruined melty plastic-infused dinner? This high quality non-stick silicone and wooden kitchen tools set means NO MORE MELTING PLASTIC KITCHEN ACCESSORIES! ★ WHY ACACIA? This durable hardwood is naturally antibacterial - important for the kitchen! - and can last up to 40 years with the proper care. The wooden handles have great heat insulation, protecting your hands from scalding. The silicone heads can withstand temperatures ranging from -22°F/-30°C to 392°F/200°C. ★ FALL IN LOVE WITH COOKING ALL OVER AGAIN with Home Hero's premium kitchen utensils set. While there are many choices that look good in photos, THE TRUE TEST IS BRINGING THOSE KITCHEN COOKING UTENSILS INTO YOUR KITCHEN. Their easy-to-grip, comfortable handles and balanced weight make cooking a joy and their large hanging holes help keep your cookware set orderly and organized. ★ HOME HERO WAS CREATED BECAUSE WE WANTED SOMETHING BETTER. Tired of choices swinging from cheap & flimsy to too expensive to be sane, we wanted to create the feeling of being a pampered chef without the price tag. We wanted a kitchen tool kit that made us feel like KITCHEN HEROES! YOU ARE A BETTER COOK THAN YOU IMAGINE. You just need the kitchenware set to prove it! Now you have it. With the Home Hero Cooking Tools Set, you can win meal time any day of the week!